The rapid evolution of LED lighting technology means that the production of PCBs needs to be more responsive to change than ever before. Only then can the benefits be passed on rapidly to customers, says Tamtec Electronics’ Business Manager, Dave Billingham. No one could deny that the last half decade has witnessed a fundamental shift in approach to industrial and domestic lighting with huge swathes of customers making the transition from traditional fluorescent lighting to next-generation LED technology. Lower power consumption and longer operating life cycles are among the primary factors behind what has become a global revolution. But what should not be overlooked is the fact that LED lighting technology itself continues to be the subject of significant change. In particular, the efficiency of LED has improved dramatically, particularly during the last few years, and this has had positive implications for printed circuit board (PCB) design. Whereas five years back suppliers might have hoped to achieve 100 lumens per watt from a PCB, now an output of 180 lumens is frequently achieved – and there is every indication that the 200 lumens ‘barrier’ will be smashed before the end of 2017. One of the key agents of progress here has been the availability of increasingly efficient white LEDs. In the early days they seemed to be individually quite highly powered, so one of the main considerations was thermal management. It was vital to prevent overheating if the LEDs were to remain reliable. But more recently there has been a move towards lower powered LEDs, leading to the incorporation of more, smaller LEDs on a circuit as opposed to a smaller number of larger LEDs. Consequently, the heat generated by each individual LED has decreased and it is possible to spread the heat around the circuit board. Whilst it would be inaccurate to say that thermal management is no longer an issue, it is certainly a much reduced problem these days. All of which means that PCB design needs to be more responsive to change than ever before. 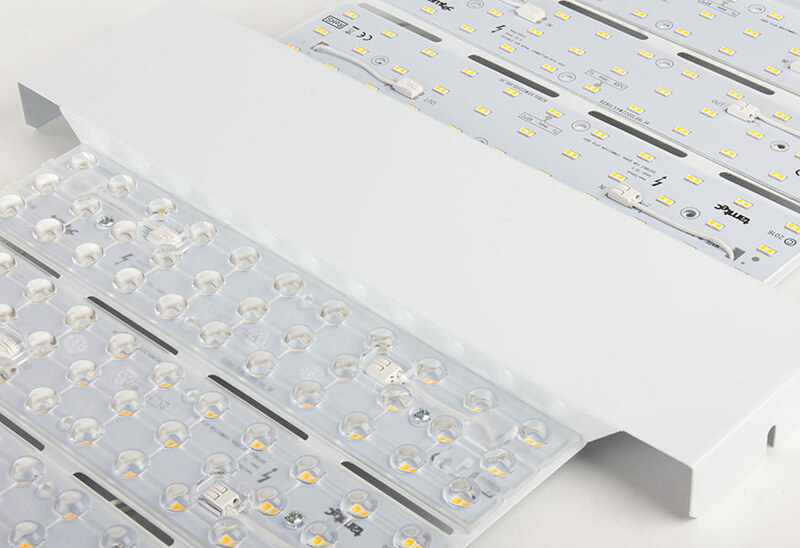 For many leading LED lighting suppliers, this has necessitated a comprehensive review of their design and build processes – not least in terms of the way that PCBs are sourced and produced – in order to ensure that the benefits can be passed on to customers without delay. It’s certainly become a priority issue at UK-based company Tamlite – which has been providing an extensive range of products and services to all sectors of the lighting and fire alarm markets for 50 years – and its component manufacturing division Tamtec Electronics. For some years it had been clear that the cycle of obsolescence for circuit boards was speeding up, and that Tamlite needed to review its long-held policy of sourcing the vast majority of its PCBs from the Far East. With delivery times frequently exceeding four or five months from the point of ordering, PCBs were often being rendered as ‘old technology’ before each consignment had been exhausted. Therefore, Tamlite took the decision to begin taking all of its PCB manufacturing in-house via the Tamtec subsidiary. Already the benefits of the change and investment have become apparent to both Tamlite personnel and customers around the world. Furthermore, the scope and efficiency of the Tamtec operation is set to increase further in 2017, thanks to a recent £0.5m investment in production facilities focused on high-performance PCBs. As well as underlining Tamlite’s commitment to UK R&D and manufacturing, the move to bring an increasing amount of componentry on site will also help to offset possible costs incurred as a result of Brexit and the rising price of aluminium and other primary materials. The overall result is that the advantages of improved LED lighting efficiency and PCB design can now be transferred to customers in record time. With the competitiveness of the lighting sector increasing all the time, and end-user expectations of output and life cycle becoming evermore exacting, it is likely that more suppliers will look to consolidate every aspect of production – including PCB design-and-build – on-site and in-house. Indeed, in an area of technology that is literally changing on a monthly basis at present, it might just be the only way to remain relevant.